Brick Town Talk: Inspiration of the Day - 10/22/11 - LEGO Town, Architecture, Building Tips, Inspiration Ideas, and more! 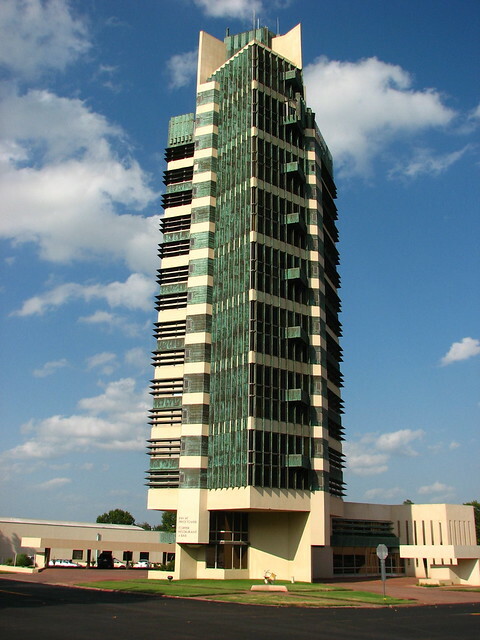 Bartlesville, Oklahoma - (BTT) While Frank Lloyd Wright is perhaps the most famous architect of all time, he wasn't one to build vertically. The Prairie Style homes he is synonymous for were all about the horizontal expression, and while his iconic buildings like the Guggenheim Museum are famous for a lot of reasons, being tall isn't one of them. Completed in 1956 towards the end of his life, the 19 story Price Tower became Wright's first and only realized skyscraper, not that he didn't dream bigger. Apologies for going a while without an Inspiration post - I'm trying to get this back to a weekly feature again starting now. Ashley - I couldn't agree more. I have yet to build it, but I just picked up the Robie House set from the Lego Store. This is the first model that does the original building justice for me - Fallingwater and the Guggenheim just didn't wow me.